I’d like to think I’m unpredictable, but I’m beginning to realize, I’m not. Not even close. And, you know what, that’s really not a bad thing. At least you know what you’re getting from me. Right? It’s not like I’m giving you the same recipe though. I’ve done lemon bars, cookies, and cupcakes. All with Oreos. Now, that’s variety. 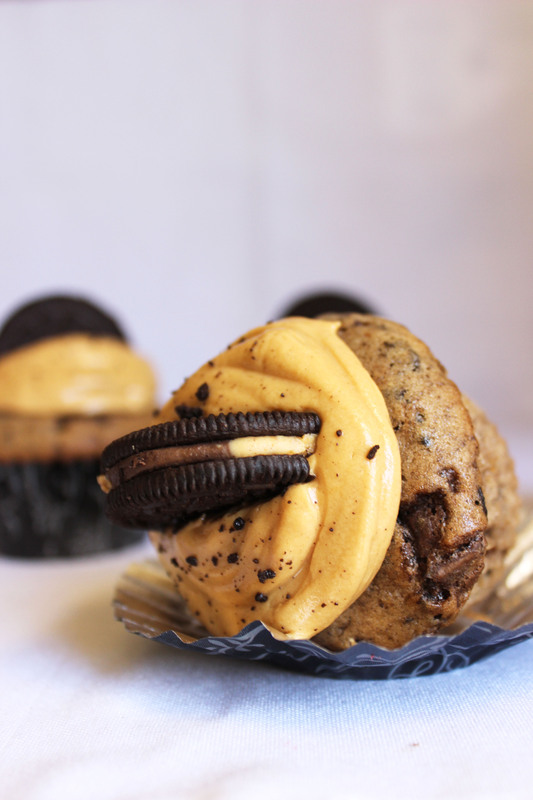 Some may even go as far as saying I’m unpredictable with my Oreo baking. Ah ha, unpredictability. Yeah, I don’t know why all of a sudden it’s important for me to be unpredictable. Maybe I’ve gone crazy? Or, maybe, just maybe, I’m slightly tired, under caffeinated, and really like typing the word unpredictable for some reason. Seriously, it has so many letters. But, enough of my nonsense. 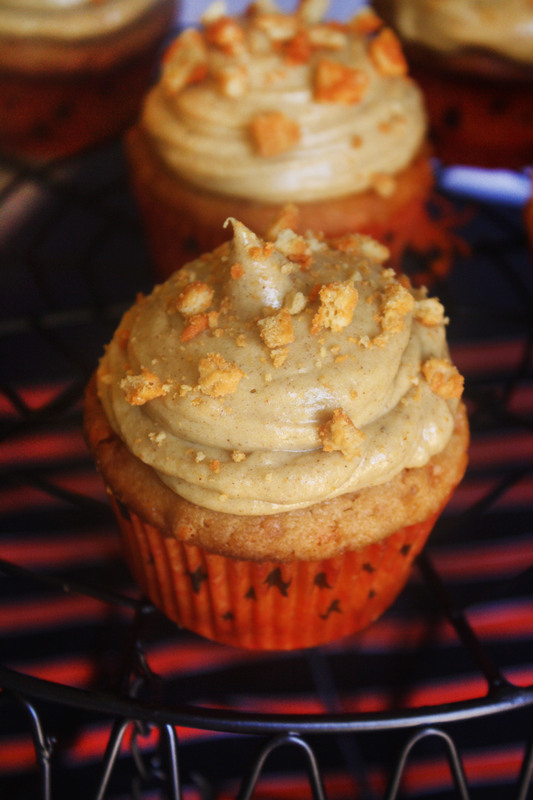 Lets talk about the other main ingredient in this recipe. Drumroll please. Guys, this is my first pumpkin recipe of the year. Aren’t you proud that I waited until the end of October to share it with you? For those of you that are new to Hint of Nutmegg, let me briefly share the story of the pumpkin craze of 2013. I went a little overboard on the pumpkin. How overboard? Let’s just say I posted 5 pumpkin recipes in a row. I know it doesn’t sound like a lot, but it totally was. I over-killed the pumpkin. And, even I, the biggest pumpkin fan in the world, was tired of it. It was pretty bad. Don’t worry though. There won’t be a pumpkin craze of 2014. I’ll be better. But, I hope you know, by being better, I don’t mean this will be my only pumpkin post. I’m planning on at least two more. I think that’s reasonable. Don’t you? 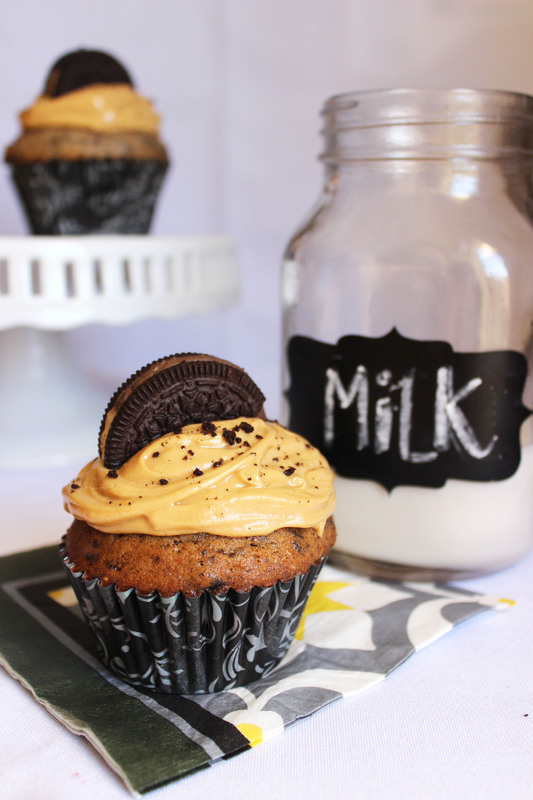 So, lets talk about these Pumpkin Spice Oreo Cupcakes with Pumpkin Cream Cheese Frosting. In three words, to die for. 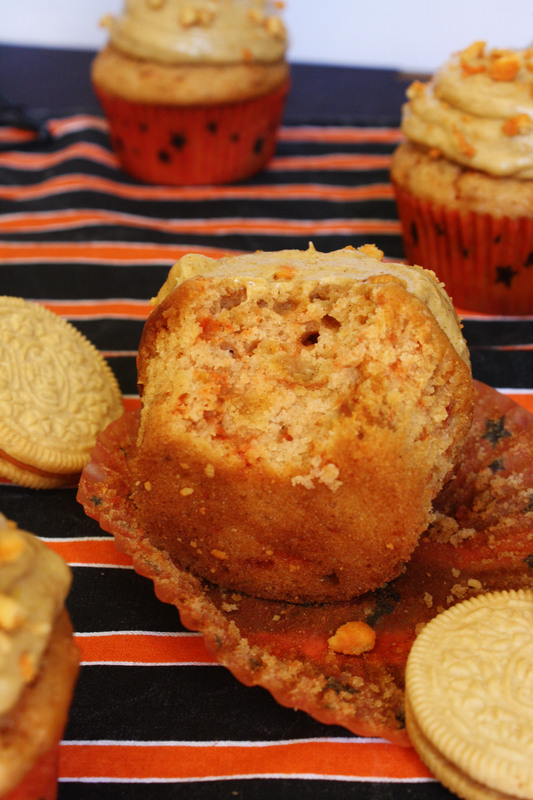 The cupcakes are super moist and have a subtle pumpkin taste, thanks to the Pumpkin Spice Oreo crumbles that are baked into the cupcake. 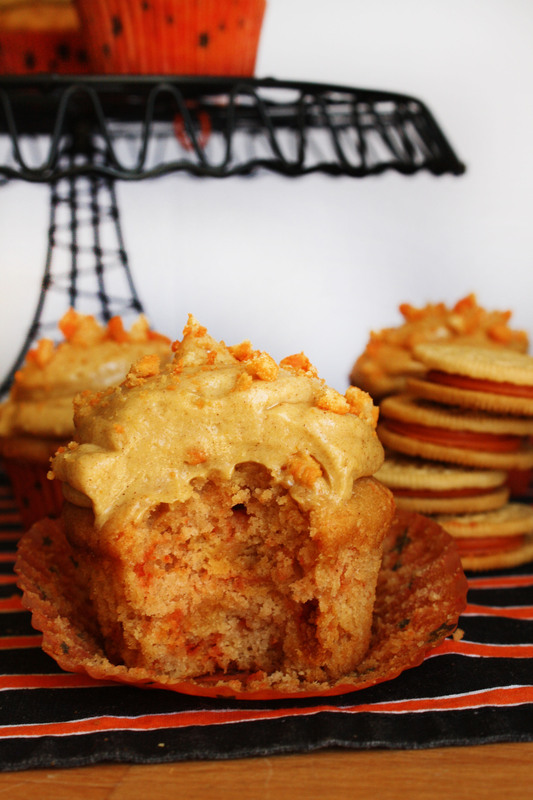 Each cupcake is then topped with a creamy, pumpkin packed frosting that is out of this world. I repeat, out of this world. I’ll admit I was eating it out of the bowl. 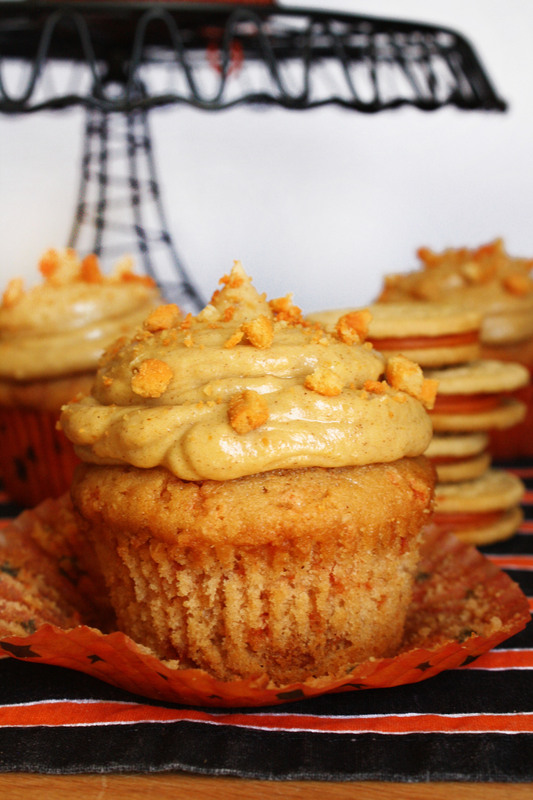 It’s the perfect balance between cream cheese and pumpkin spice, and really brings this cupcake to a whole new level of pumpkin yumminess. 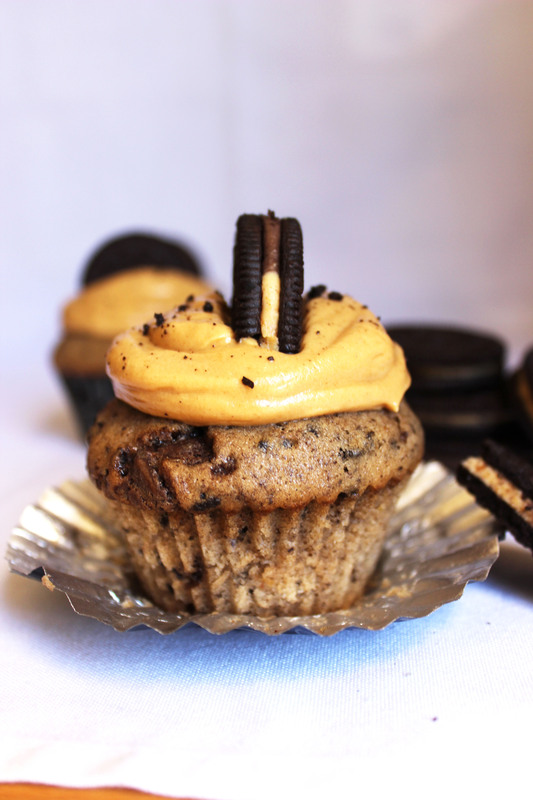 For a topper, I crumbled some of the Oreos on top of the cupcake to add a little crunch—keep in mind, when putting the cupcakes in the refrigerator though, the Oreo crumbles on top will get soggy. Preheat oven to 350 degrees and line a muffin tin with 12 cupcake liners. Set aside. In a large bowl, whisk together flour, baking soda, baking powder, salt, and pumpkin pie spice. Set aside. In a medium microwave safe bowl, melt the butter. Whisk in the sugar–the mixture will be very thick…use those muscles! Add the egg whites, whisking until incorporated, and then add the sour cream, milk, and vanilla. Whisk until mixture is smooth and uniform in texture. Using a spatula, gently fold in the chopped Oreo pieces. Divide the batter between the 12 cupcake liners–about 3 tablespoons per each tin–and bake for 20-22 minutes or until a toothpick inserted in the center comes out clean. Let cupcakes cool completely on a wire rack. 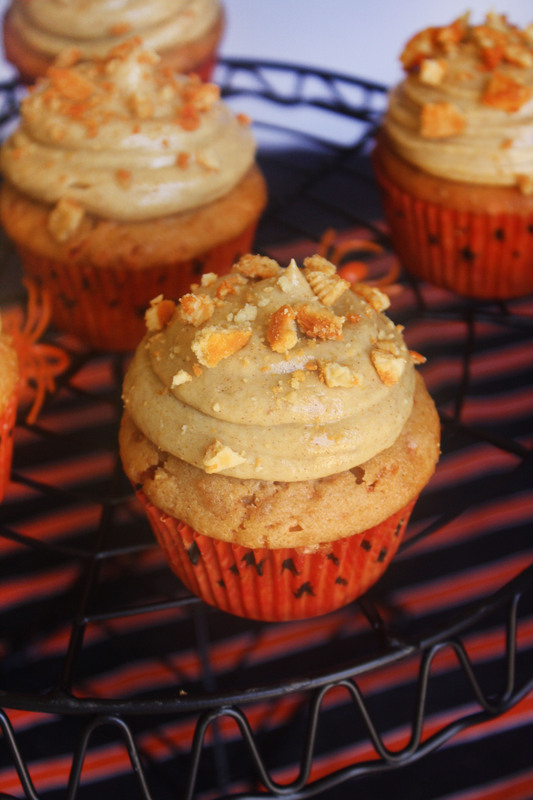 While the cupcakes are cooling, start making the pumpkin cream cheese frosting. 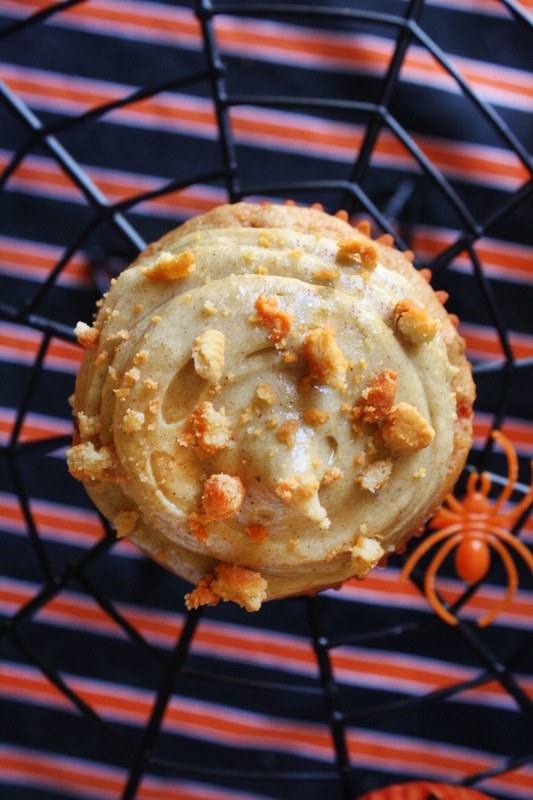 Using a handheld electric mixer or a stand mixer with a paddle attachment, beat the cream cheese, butter, pumpkin puree, brown sugar, and spices on medium speed until creamy and combined. Add the powdered sugar, one cup at a time, and then mix in the flour. 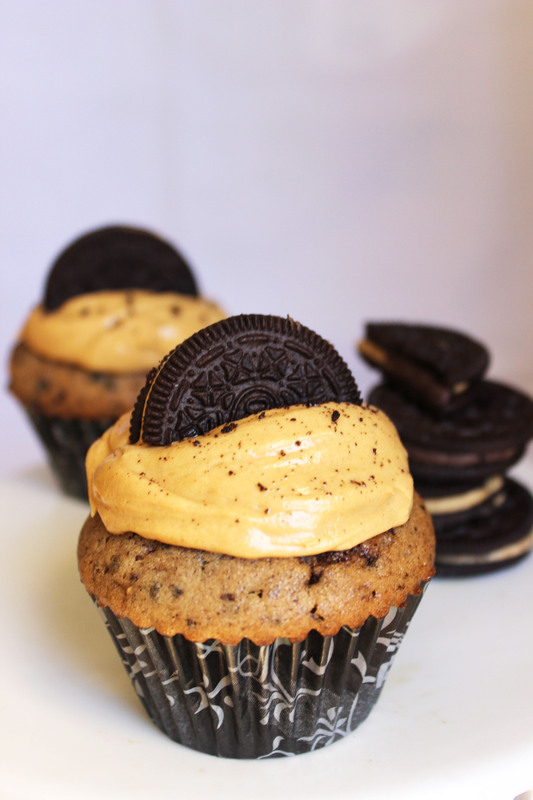 Frost the cupcakes as desired and top with crumbled up Pumpkin Spice Oreos. I’ve told you how much I love Oreos and peanut butter. How I like to dip to smother said Oreo with as much creamy peanut butter as possible before stuffing it into my face. Not very lady like, I know. That’s my comfort food. My pick me up. 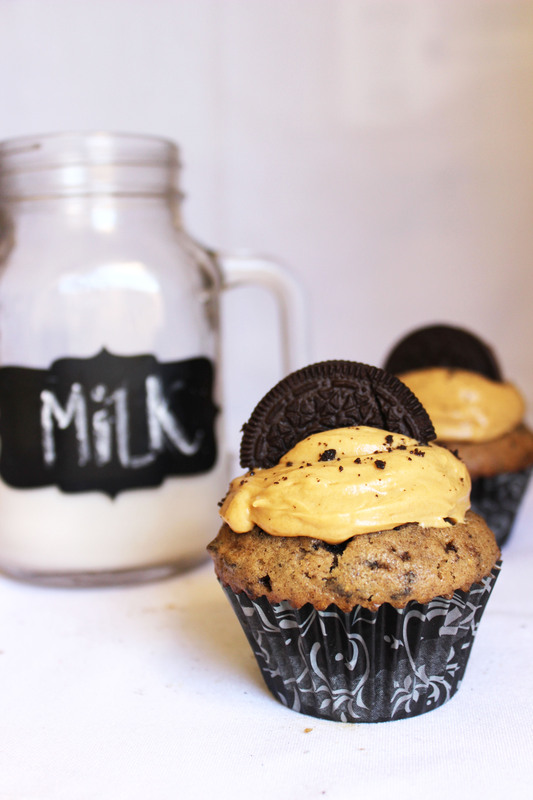 Oreos, peanut butter, and a large glass of milk. That’s what I eat when I need to feel happy. BUT, sometimes (very rarely) there isn’t a jar of peanut butter around. And I’m left with just regular Oreos and milk. And, guess what? That’s perfectly fine too. The thing is, I like Oreos in general. With or without peanut butter. Double stufed or not. Flavored filling or regular. I’m an Oreo lover. Period. No ifs, ands, or buts about it. I’m that girl who walks down the cookie aisle every time I go to the market just to see if a new flavor or a seasonal/holiday themed Oreo has come out. And, of course, if something new is out, I have to buy it. Just to try it or to see the different designs up close. I mean, come on, Nabisco went through alllllll that trouble to create this cookie and it would simply be rude not to purchase a pack. I, for one, am not rude (or, I try never to be rude), which means I buy the Oreos. What can I say? My mom raised me right. Double Stufed Oreos? Been there, done that. A few times. Mini Oreos? How could I not purchase them? They’re so tiny and cute. 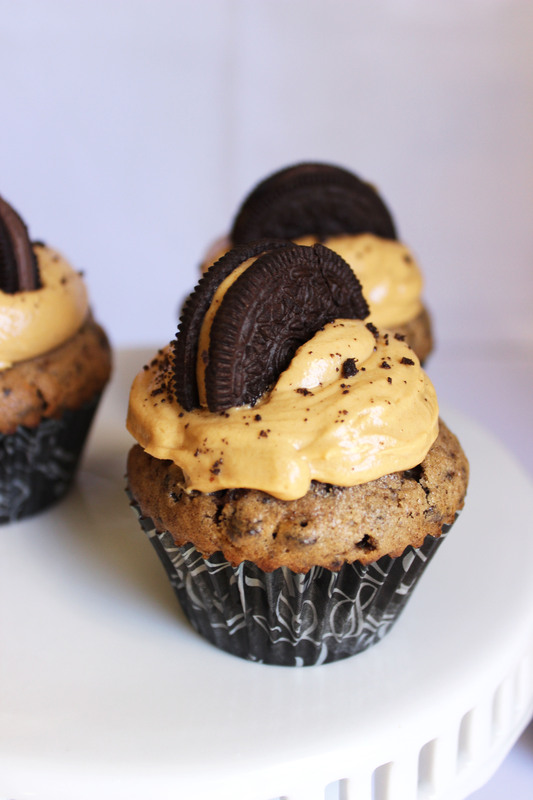 Chocolate, Peanut Butter, Golden Oreos? Yup. Tried those too. Birthday Cake, Gingerbread, Mint, Coconut, Candy Corn, Marshmallow Creme, Berry Burst? Yeahhh, basically if you can name it, I’ve most likely tried it. And, sure, I like some flavors better than others, but I try to give each new creation a fair shot. I try one cookie, and if I like it, I eat more. Sometimes I like it so much that I make an immediate market run to buy another pack—you never know when they’ll be off the shelves. The fact that I like these Lemon Creme Oreos is actually a little weird. Why? Well, lets just say I don’t really like lemony things. At all. As in, I’m not a fan of lemon bars or really anything with lemon, with the sole exception being lemonade. And, now these Oreos. And, these Lemon Oreo Creme Bars too. I figured since I liked the Lemon Creme Oreos so much, I’d give the whole lemon bar situation another try. 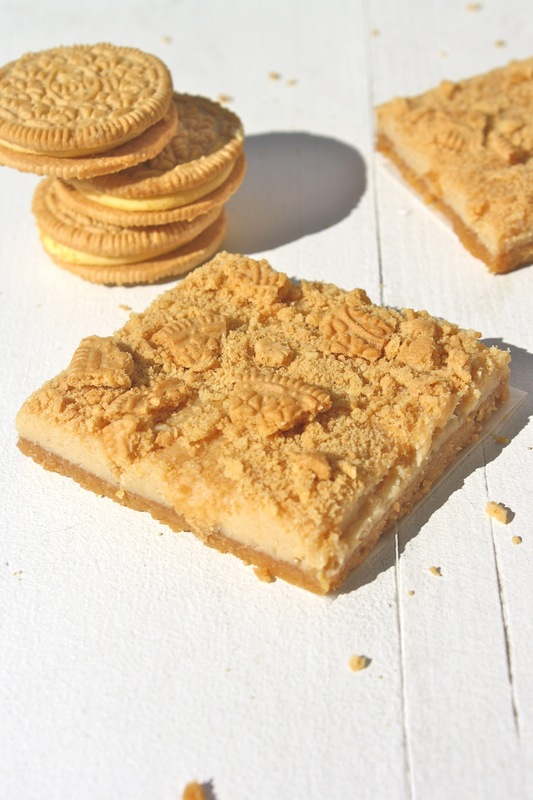 I wanted to make a lemon bar that basically tasted just like these Oreos: creamy, not too tart, but not too sweet, and not overwhelmingly lemony. 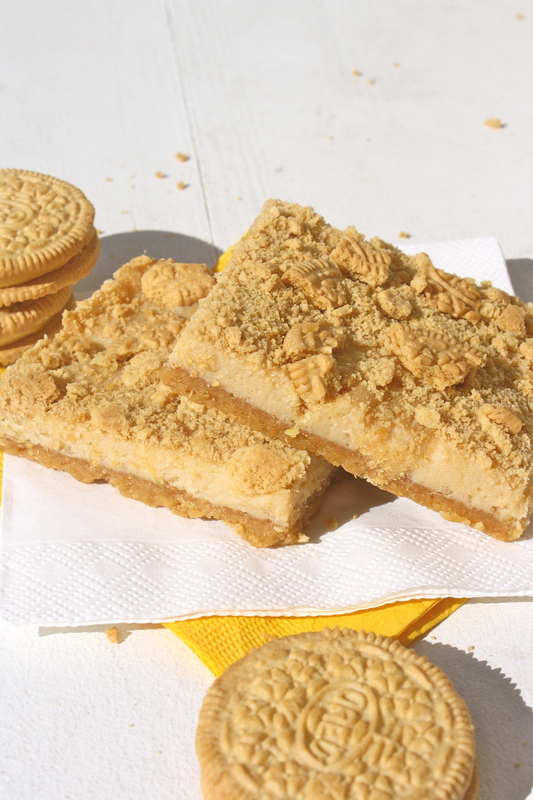 These Lemon Oreo Creme Bars have a lemon Oreo crust, are filled with a creamy lemon filling, and then sprinkled with crushed lemon Oreo cookies (minus the lemon filling). 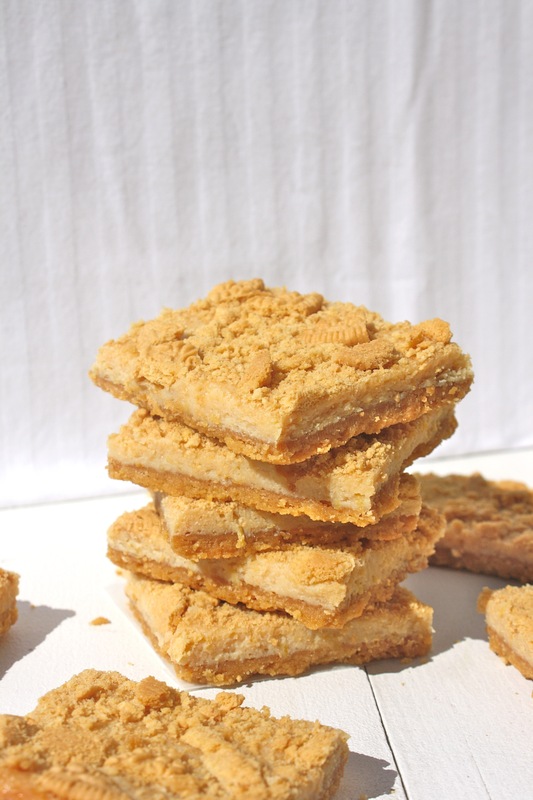 If all lemon bars tasted like this I would eat them on the regular. 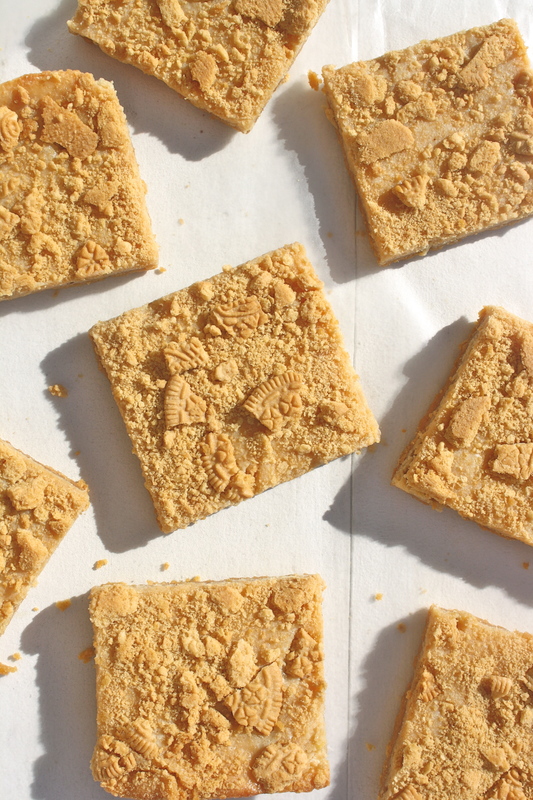 Seriously, these bars are perfect for lemon lovers and non-lemon lovers alike. They are creamy, lemony, but not in an overpowering way, and the perfect balance between sweet and tart. Did I mention super easy and quick to put together too? Preheat oven to 350 degrees and line an 8×8 or 9×9 pan with parchment paper. Set aside. 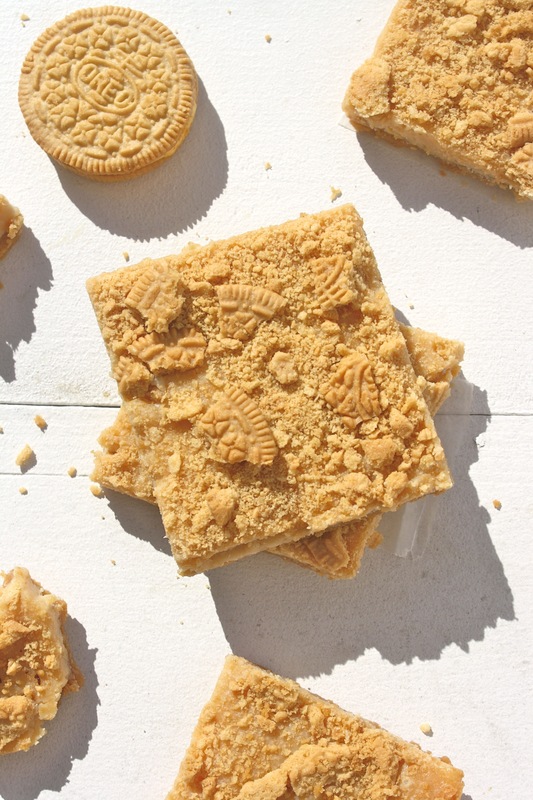 In a food processor pulse the whole Lemon Creme Oreos into a coarse crumb. Pour crumbs into a medium-sized bowl and stir in the melted butter. Press crust into the lined pan and bake for 9 to 10 minutes. Let sit on top of the stove as you prepare the filling. In a medium-sized bowl combine sweetened condensed milk, lemon juice, and grated lemon peel. Pour over the warm crust—use a spatula to make sure it’s spread evenly. Sprinkle the crushed Oreo Cookies (with the filling scooped out) evenly on top of the lemon creme filling. Bake for 24 to 26 minutes, or until the top is a light golden brown. Let cool to room temperature and then place in the fridge for 30 minutes before cutting into squares.